What if you could divide space without a traditional wall or room divider, breaking up living areas with a sense of style? With the Peninsula Fireplace or a See-Through Fireplace, you can. Its see-through view adds a sense of unity, beauty, and luxury to what would otherwise be a simple divider. Partition walls are great space dividers, but they’re also challenging from an interior design perspective. They jut partway into a room, taking away the potential for clean, modern design. Without some form of decoration or embellishment, they suffer from a sense of incompleteness, as if something had been left unfinished or unsaid. So, how do you complete the picture? From painting the entire wall in a bold accent color to installing a fireplace, there are many ways to transcend the mundane and turn a plain dividing wall into a beautiful statement. Of all the possibilities, the Peninsula Fireplace remains one of most creative, elegant, and practical solutions to the “divider” problem, particularly if you take advantage of our advanced Cool Wall Technology to place a TV or a piece of artwork above the fireplace without risking damage. Why are our Peninsula and See-Through Fireplaces so intriguing? Perhaps it’s the transparent glass that draws the eye and lets you see through to the next room while maintaining a view of the flame. Perhaps it’s the asymmetrical placement (both vertically and horizontally) that creates interest. Or perhaps it’s the flame dancing in a straight line that stretches nearly the entire length of the linear firebox. Perhaps it’s because you could stare at it for hours, lost in its beauty and marveling at the state-of-the-art technology that makes it possible. With its sleek design and a large glass viewing area that’s visible from three sides, the Peninsula is more than a fireplace; it’s a stunning architectural element and the heart of the home. Instead of merely taking up space, it fills a space, creating depth and emanating beauty. 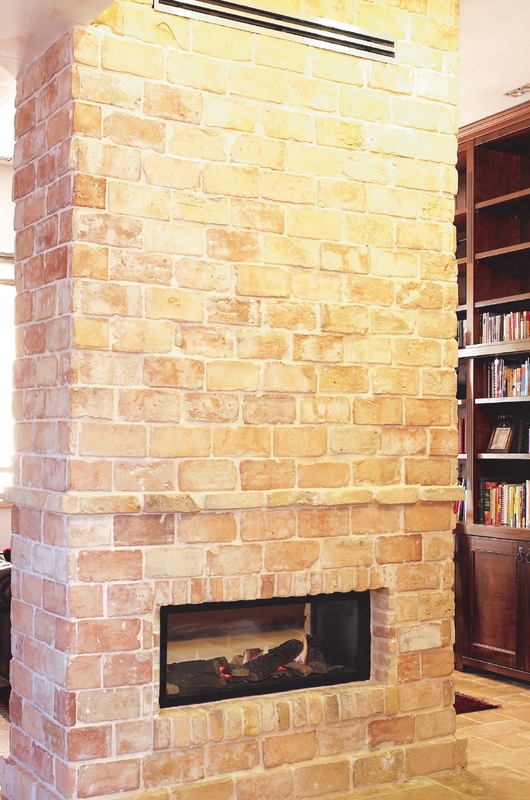 It fits snugly inside a dividing wall, transforming it from a solid barrier into a living, breathing work of art—not to mention, a functional fireplace that warms a room. When it comes to placement, the options are nearly limitless. You can install a Peninsula fireplace between the kitchen and the dining room so everyone can enjoy the flame, whether they’re cooking or eating. You could also install it between the entryway and the living room, the hallway and the main room, or even a master bathroom and a master bedroom. Double-sided fireplaces like our Peninsula model have even become increasingly common in hotel lobbies and upscale restaurants where they welcome guests with their unique, modern charm. Wherever it goes, this linear gas fireplace reflects the best of modern design while still holding on to that timeless quality that defines true elegance. Lyric brings luxury within reach. Our Peninsula Fireplace is one of six product lines that combines elegant styling with advanced technology and value-engineered manufacturing. With the right model and a great vision, you can push the limits of modern design and overcome nearly any architectural challenge. Want more inspiration? Take a look at our other fireplace models. Not yet convinced that you should install a modern gas fireplace in your home or business? Learn more about Lyric’s many advantages and discover why it’s the best fit for almost any space.